After a long winter spent cooped up indoors, you might find yourself champing at the bit to get outside. The last thing you may want to do on a sunny spring day is spend all day inside dusting, decluttering, and deep cleaning. So, why not take the concept of spring cleaning outdoors? Early spring is an ideal time to take care of many lawn and garden chores. Now is the time to assess your lawn, provide basic lawn maintenance, and prepare your garden beds for new plants. By addressing outdoor gardening chores now, you’ll save yourself a lot of work later in the season. 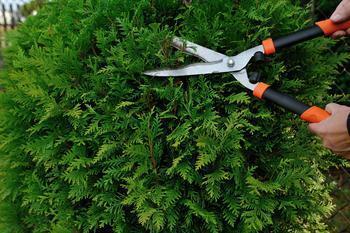 Here are a few outdoor gardening tasks to consider doing now, while the weather is still mild. A healthy, green lawn looks great and boosts a home’s curb appeal -- but your lawn may not be so green after having been steeped in snow, decaying leaves, and winter debris all season. To wake up a winter-weary lawn, rake it anywhere that it has yellowed to remove the dead area and prepare for reseeding. Then, aerate your lawn to allow its root system to receive sufficient air, water, and nutrients from the fertilizer. Even out tall, gangly grass by giving it a mow. Make sure to fill your lawn mower with gas and oil, check the carburetor, and sharpen the blade using a metal file if necessary. Spring flowering shrubs -- such as lilacs, forsythia, and rhododendrons -- should be pruned in late spring, right after they finish blooming. Decorative grasses should also be cut back this time of year. Prune roses before leaf buds appear and trees before their buds begin to open. Additionally, remove all burlap or tree guards you might have put in place to protect your trees in the winter months. In warmer weather, tree guards stop air flow to the trunk and promote bark rot. Tilling allows nutrients to make their way to new plants. But make sure conditions are right before tilling or working flower beds -- digging in wet conditions can damage the structure of the soil. To see if your soil is ready for tilling, ball up a small handful of soil and drop it on the pavement. If it retains its shape, it’s too wet. Once your garden is tilled, you can begin replanting perennials and enhancing your flower beds. Be sure to lay out where your plants will go first in order to see if they will have enough space and get enough sunlight.